Textures are images mainly used in materials. Xenko maps textures to the surfaces the material covers. Textures can add color information to a material — for example, to add a brick pattern to a wall or a wood pattern to a table. 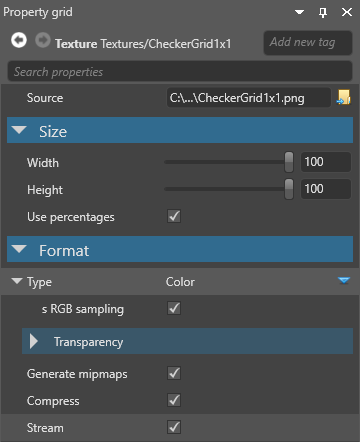 The values of the pixels in a texture (texels) can also be used for other calculations, such as in specular maps, metalness maps, or normal maps. Materials typically contain multiple textures; for example, a material might contain a color texture, a normal map texture, and a roughness texture. Textures can also be used outside materials; for example, you can draw them directly to the UI, or use them in sprites. Xenko only imports the first frame of animated image files, such as animated gifs or PNGs. They don't animate in Xenko; they appear as static images. Xenko currently doesn't support movie files. Render targets are a different kind of texture, and don't use images. Instead, they render the output from a camera. For more information, see Render targets. The following properties are common to all textures. 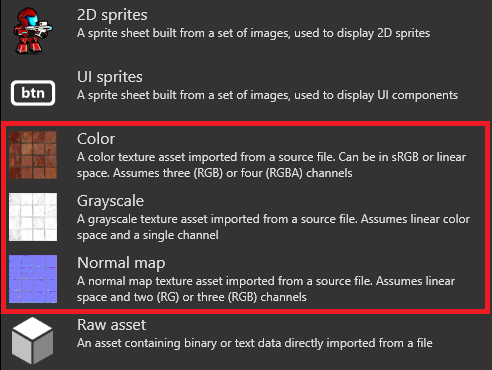 Type Use Color for textures you want to display as images, Normal map for normal maps, and Grayscale to provide values for other things (eg specular maps, metalness maps, roughness maps). Color textures and normal maps have additional properties (see below). Generate mipmaps Generate different versions of the texture at different resolutions to be displayed at different distances. Improves performance, removes visual artifacts, and reduces pop-in when using streaming, but uses more memory. Unnecessary for textures always at the same distance from the camera (such as UIs). Compress Compress the final texture to a format based on the target platform and usage. The final texture is a multiple of 4. For more information, see Texture compression. Stream Stream the texture dynamically at runtime. This improves performance and scene loading times. Not recommended for important textures you always want to be loaded, such as splash screens. For more information, see Streaming. 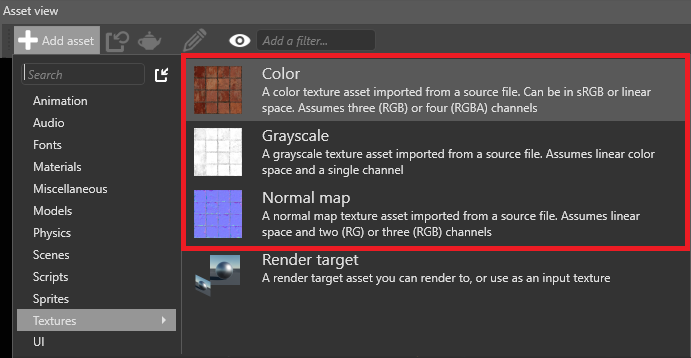 The following properties apply if you set the texture type to color. sRGB sampling Store the texture in sRGB format and convert to linear space when sampled. Recommended for all color textures, unless they're explicitly in linear space. Color key color The color used for transparency at runtime. 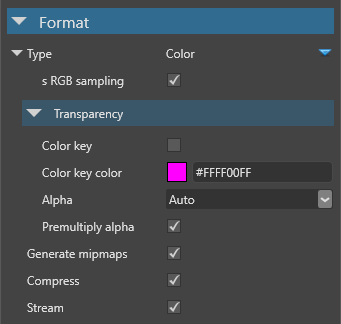 Only applied if Color key enabled is selected. The following property applies if you set the texture type to normal map. Invert Y Have positive Y-component (green) face up in tangent space. This depends on the tools you use to create normal maps. For more information about normal maps, see the Normal maps page. Grayscale texture use only the R channel of the image (finalRGBA = originalRRRR). If you add a texture to a scene (as a sprite component), and set the texture type to grayscale, it appears red, not monochrome. This is because the image uses the R (red) channel. To make the channel monochrome, in the Sprite component properties, set the Type as Grayscale. For more information about the sprite component properties, see Use sprites. Note how the blend map texture corresponds to the patterning on the result. For more information, see Material maps. For instructions about how to access the global texture settings, see the Game Settings page. Texture quality The texture quality when encoding textures. Fast uses the least CPU, but has the lowest quality. Higher settings might result in slower builds, depending on the target platform.